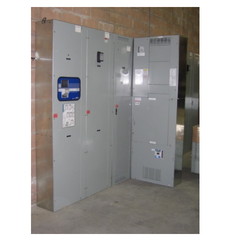 Our product range includes a wide range of power distribution panel, automatic power factor panels, custom electrical panels and electrical panels. 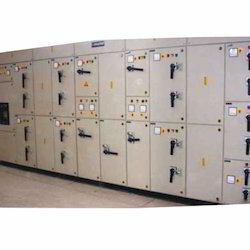 Power Distribution Panel are designed & manufactured as per customer requirement. The cabinet is fabricated using high grade CRC Sheet & duly powder coated. Electrolytic grade aluminium & copper bus bars are used in the panel as designed for heavy duty current. The bus bars supports are high quality DMC & SMC components of reputed make. The switch gears used in the panel are of world renowned companies & are tested before applying powers. Input output volt meters, ammeters, indicating lights energy meters are also provided in the panel. 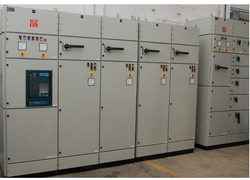 Automatic Power Factor Panels are designed and manufactured as per customer load requirement. The capacitors used in the panel are MPP & APP types high quality reputed company make. Harmonic reactors are used in series with capacitors to limit the harmonic current and safety of the capacitor and the system. 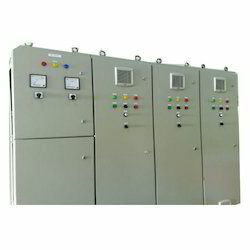 The power factor relay used is fully automatic microprocessor based which calculate the power factor and reads the capacitance of the capacitors and the requirement of the system. Heavy duty step-start contractor are used to switch on and off the capacitors. Other details :Capacitor used : MPP & APP types Used Fully automatic microprocessor based On/Off Switch : Heavy duty step-start contractor used If you are interested and want to buy the poduct click below. Owing to our profound industry experience, we are able to manufacture, export and trade a qualitative range of Custom Electrical Panels. Manufactured using superior quality raw material procured from the trusted vendors of the market, these products are extensively used in various industries such as chemical industries, Petroleum and Refineries, Oil and Drilling Industry and Piping industries. Owing to their excellent performance, robust construction and superior quality, these products are highly demanded by the clients. We Design, Manufacture and Commission, all types of Industrial Panels for almost all types of industries. The Panel is fabricated with 2mm CRCA Sheet of TATA. Looking for Digital AC DC Drives & Electrical Panels ?